Victoria ParkGrove Road,, Bow, London, E3 5TB. 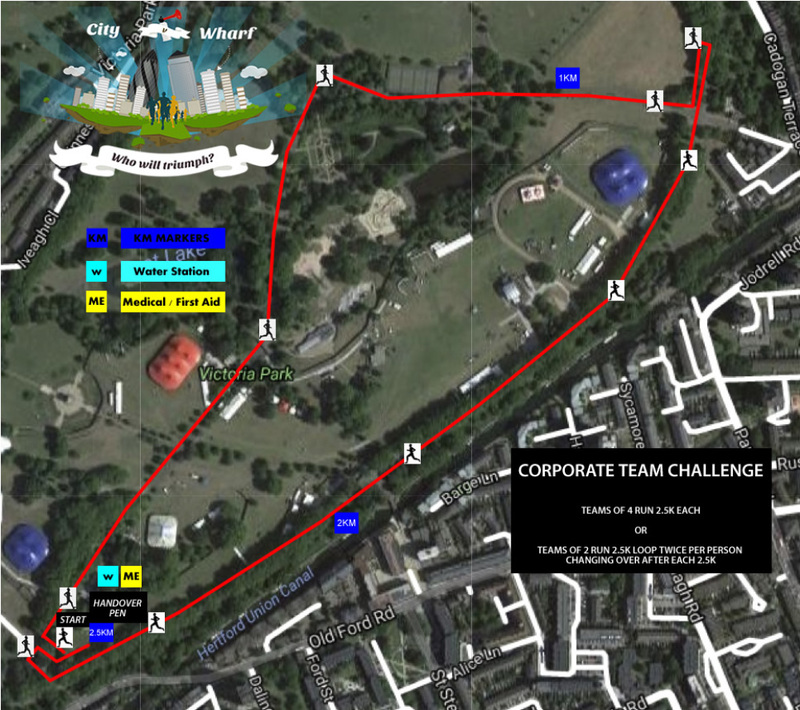 Now is the time to secure your team entry or entries and send out the challenge to your rivals in the City or Wharf and get ready for this fantastic event! Once your booking has been made you can decide on your team members, who is on your team is completely up to you and we don’t need to know their names. You can enter as many teams as you wish but please give each team a different name! Team members can run in any order they wish, this is up to the team to decide on the day. If entering teams of 2 each runner runs 2.5km then hands over the race chip to their team mate before doing a second 2.5km. If entering teams of 4 each runner just runs 2.5km and hands over the race chip and the last runner heads over the finish line. Your race packs can be collected at the event and will include your race number and timing baton. You can collect your race numbers for your entire team and it's up to you to decide the order of your runners. (We do not require the other team member names) Please note Batons must be handed back to our team after you complete the event. Failure to do so will result in a £45 fee as batons are very expensive to replace. 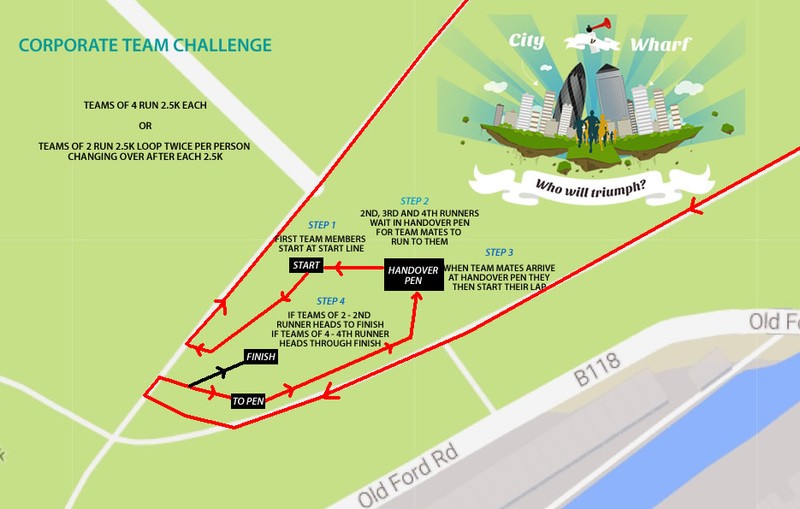 The City v Wharf 10k Team Run Challenge will start at 6.30pm so please arrive at least 30/40 minutes prior to the event start. Please make sure you pin your race number to the front of your t-shirt. The event hub is based on the grass section to the right after entering Crown Gate. A marshal will be at this gate to guide you to the event hub. From Mile End Station its about a 15 minute walk to the park. Please be sure to plan your journey to arrive on time. Situated at our event hub. This is located next to the registration tents. Please note space is very limited so travel as lightly as possible. If you require bag storage make sure you arrive with plenty of time to spare. The run will kick off at 6.30pm. The first person running in your team will gather in at the start area and all second runners will gather in the run pen to wait for the baton handover. Teams of 4 runners 3 and 4 will enter the run pen as soon as the runner before them has headed out to do their 2.5k loop. There will be marshals around the course to support and encourage you. Please note placings for this race will be based on chip time. Please take care when running around the course as this is public land and local residents will be out and about. Please always stay on the left unless otherwise guided. Enjoy this great run around Victoria Park. Results will be displayed on our race timing screen so after crossing the finish line you can check out your time. Results include team placings for male, female and mixed teams. Companies can enter as many teams as they like. Each team has to have a unique team name. i.e Fix Events Team 1, Fix Events Team 2. Everyone will receive a very cool medal and some great goodies! Results include team placings for male, female and mixed teams. Companies can enter as many teams as they like. Each team has to have a unique team name. i.e Fix Events Team 1, Fix Events Team 2. Trophies will be awarded to winning teams. Please note these will be presented during the week after the event as all results will need to be assessed. You will be able to check out your instant race results on our race timing screen. Start spreading the word across the City and Wharf now and let the battle commence! There is no carparking in Victoria Park so if driving please plan ahead where you will park. From Mile End Station, turn left and cross over Mile End Road. Turn right onto Grove Road – it’s about 10-15 minutes walk straight down. Alternatively, you can also walk most of the way through Mile End Park, which runs parallel to Grove Road. You will first arrive at the Crown Gates. Entries close on the 23rd April, 2019. Event prices exclude 10% booking fee. Grove Road,, Bow, London, E3 5TB.